Midtown i Kairo, Egypten : Boka nu! Over 4 years of Egyptian tourism experience. We are two friends working in hostels for almost 4 years and now we started The Midtown Hostel to maintain an awesome accommodation, we are right beside bars, shops and restaurants. We aim to create a cozy place that makes you feel home. Facilities: 24/7 Reception, 24/7 Information desk, Breakfast included, Free pick up from the airport when you booking for 3 nights. The Nile River or visit the Egyptian Museum, all within 15 minutes’ walking distance. 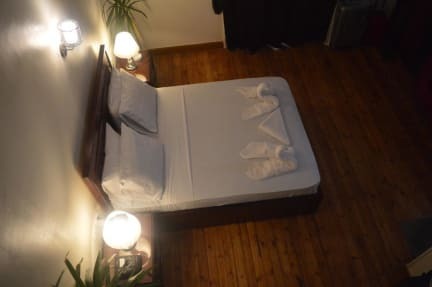 The hostel is within 30 minutes’ drive to Pyramids of Giza. Cairo International Airport is 17 km from the property. Each room is equipped with a flat-screen TV, 24/7 hot water, Air conditioner, Telephone, Mini Bar, Hair dryer. Some rooms feature a seating area for your convenience. Most rooms have a private bathroom for your comfort, you will find slippers and free toiletries and free access WiFi. Our dorms have shared bathrooms and come with bunk beds.